“I thought perhaps you’d like to see a demonstration of the new massage chair that we just got in. It — the reason for its — it looks revolutionary, it doesn’t look really like a typical massage chair, and that’s because I think Mies van der Rohe had a part, or at least he was a consultant, to the firm that designed this…”. 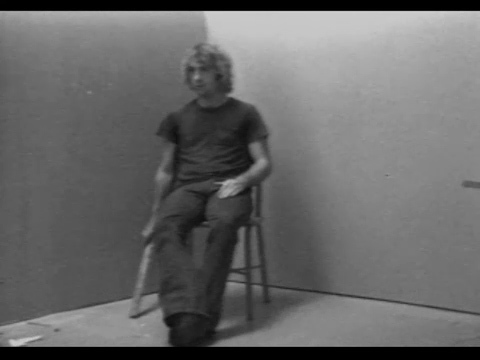 William Wegman opens the video short titled Massage Chair with this grand statement to describe what looks like an ordinary plastic chair. At first the artist’s head is cut from the frame, but he eventually sits down to “demonstrate” the extraordinary qualities of the chair. One of the works on Selected Works: Reel 3, produced during 1972-73, and re-mastered in 2005 when several newly available titles were added. Although this work does not feature his dog and video companion Man Ray, it is a humorous example of the artist’s penchant for skit parody, poking fun at television ads and infomercials.